Movie Review - The Tale of the Princess Kaguya - Honk if you love justice! I FINALLY got to see a show at the North Park, and I was thrilled that it was this one, Studio Ghibli’s The Tale of the Princess Kaguya. Isao Takahata’s latest is a beautiful and heart-rending re-telling of the Tale of the Bamboo Cutter. One day, a bamboo cutter sees a glowing stalk of bamboo in the forest. 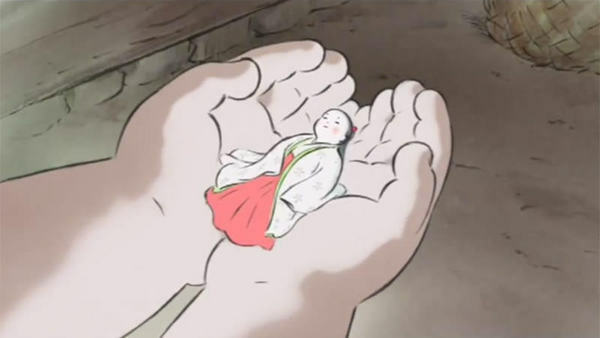 In it, he finds a tiny girl, which he takes home to his wife. The little ‘princess’ magically turns into a baby, one that grows extraordinarily quick, earning her the nickname ‘Little Bamboo’ from the village children. The bamboo cutter finds more glowing stalks in the forest, filled with gold and fine silks. He takes little bamboo away from the village and to the capital, building a fine mansion with servants and a governess to teach her the ways of nobility. She pushes back against the strict behavior rules for girls and women, longing for the village where she could be free and happy. As she gets older, the rumors of her beauty spread, and she and her father have to deal with suitors for her hand in marriage. Again she balks at society’s rules for how she should look and get married, and she manages to hold off the five government ministers who came calling with some cleverness on her part. This draws the attention of the Emperor himself. I won’t say more about the story so as not to spoil the more fantastical parts, but it is quite melancholy at the end. 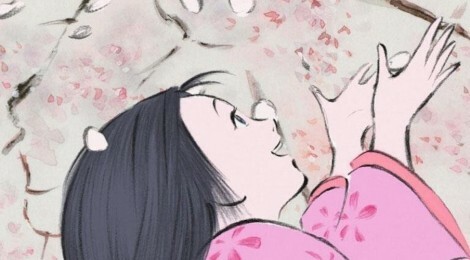 Without a doubt The Tale of the Princess Kaguya was one of the most beautifully animated movies I’ve ever seen. The watercolor style, which shifts to rough slashing pencils and blasts of color when Kaguya is running and angry are amazing. If you are tired of all the 3D animated stuff out there, this is a welcome change. For those taking children, the English dub is star-studded and quite solid as is usual for Studio Ghibli – James Caan, Mary Steenburgen, and Lucy Liu are great, as is Chloë Grace Moretz as the princess. I did not make it to see the subtitled version. Also, the movie is quite long, though my 6 year old daughter and I barely noticed. If you can see it on the big screen, DO IT! Otherwise, buy a Blu-Ray and watch it – just make sure you have tissues handy for the more sensitive among you.